Criminal violence can be used to sustain and construct local political orders that undermine democratic processes. 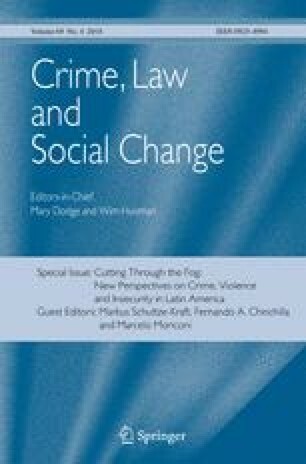 In this article, I conceptualize how criminal violence and clientelism are jointly used at local levels (e.g. neighborhoods, municipalities) to influence electoral outcomes in Brazilian urban peripheries. I call this criminalized electoral politics. With the help of two dimensions–the nature of the relationship between political and criminal actors, as well as the type of activity that provides a criminal group’s primary source of income–I construct a descriptive typology that allows me to classify different forms of criminalized electoral politics prevalent in urban spaces. Throughout the text I use examples from the metropolitan area of Rio de Janeiro to illustrate cases of criminalized electoral politics. In this way, this article offers a conceptual foundation to understand how criminal violence can affect the electoral linkages between citizens and politicians and, therefore, the quality of democracy and forms of local order in developing countries. Previous versions of this article were presented at the 2016 Meeting of the Latin American Studies Association, the Comparative Politics Workshop and the Kroc-Kellogg Peace, Conflict, Crime and Violence Workshop at the University of Notre Dame. I thank Sandra Botero, Benjamin Denison, Tanisha Fazal, Hernán Flom, Sandra Ley, Scott Mainwaring, Lucia Manzi, Steven McDowell, Ann Mische, Camilo Nieto, Richard Price, Jason Ruiz, Maggie Shum, Lucía Tiscornia, Guillermo Trejo, Amy Erica Smith, two anonymous reviewers, and the editors of this special issue for valuable comments and suggestions. The author acknowledges the generous support of the Inter-American Foundation (IAF) through a Grassroots Development Fellowship, a Fulbright scholarship, as well as the Department of Political Science and the Kellogg Institute for International Studies of the University of Notre Dame. I also thank Antonio Moreira and Julia Stadler for their superb research assistance. This study was funded by the Inter-American Foundation (Grassroots Development Fellowship) and the Kellogg Institute for International Studies, University of Notre Dame. In this article I only reference the names of people who have been mentioned in pubic sources (e.g. news, academic literature, criminal investigations). To protect interviewees, I use a code to reference the interview and do not disclose their names or other information that can reveal their identity. To further guarantee the safety of some interviewees, I do not reveal the exact location of a case mentioned in this article. Ley, S. (2017). To vote or not to vote: How criminal violence shapes electoral participation. Journal of Conflict Resolution, 1–28. https://doi.org/10.1177/0022002717708600.